This National Historical Landmark has been restored to prominence in San Jose, serving the entire Silicon Valley. Sainte Claire, where architecture, hospitality, service and cuisine combine to deliver on the promise of what a "Grand Hotel" should be.Guest Rooms feature Larkspur FeatherBorne Bed, Flat Screen TV with remote control, Cable Movie Channels, Complimentary Wireless Internet Access, DVD Players with Complimentary DVD Lending Library, Cordless Telephones, Pillow Menu and much more. 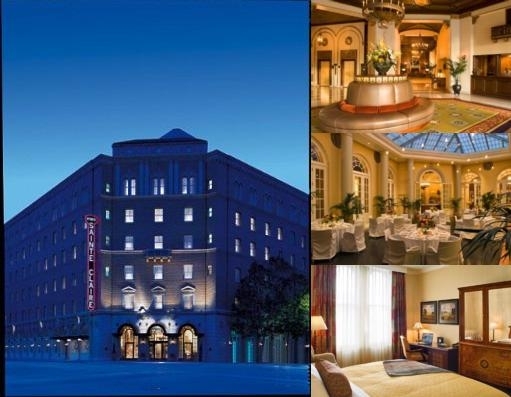 Below are the meeting, banquet, conference and event spaces at The Sainte Claire Hotel. Feel free to use the The Sainte Claire Hotel meeting space capacities chart below to help in your event planning. Hotel Planner specializes in San Jose event planning for sleeping rooms and meeting space for corporate events, weddings, parties, conventions, negotiated rates and trade shows. 35 x 49 x 17 Ft.
22 x 49 x 17 Ft.
76 x 49 x 17 Ft.
54 x 49 x 17 Ft.
38 x 20 x 9 Ft.
37 x 50 x 14 Ft.